HASKELL COUNTY, Kan. — Forty-nine years ago, Ashley Yost’s grandfather sank a well deep into a half-mile square of rich Kansas farmland. He struck an artery of water so prodigious that he could pump 1,600 gallons to the surface every minute. Last year, Mr. Yost was coaxing just 300 gallons from the earth, and pumping up sand in order to do it. By harvest time, the grit had robbed him of $20,000 worth of pumps and any hope of returning to the bumper harvests of years past. The land, known as Section 35, sits atop the High Plains Aquifer, a waterlogged jumble of sand, clay and gravel that begins beneath Wyoming and South Dakota and stretches clear to the Texas Panhandle. The aquifer’s northern reaches still hold enough water in many places to last hundreds of years. But as one heads south, it is increasingly tapped out, drained by ever more intensive farming and, lately, by drought. Vast stretches of Texas farmland lying over the aquifer no longer support irrigation. 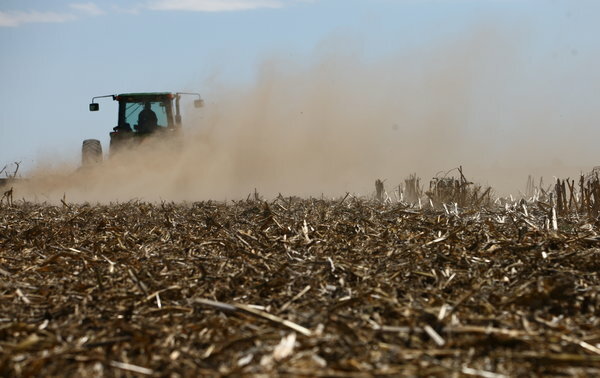 In west-central Kansas, up to a fifth of the irrigated farmland along a 100-mile swath of the aquifer has already gone dry. In many other places, there no longer is enough water to supply farmers’ peak needs during Kansas’ scorching summers. And when the groundwater runs out, it is gone for good. Refilling the aquifer would require hundreds, if not thousands, of years of rains. This is in many ways a slow-motion crisis — decades in the making, imminent for some, years or decades away for others, hitting one farm but leaving an adjacent one untouched. But across the rolling plains and tarmac-flat farmland near the Kansas-Colorado border, the effects of depletion are evident everywhere. Highway bridges span arid stream beds. Most of the creeks and rivers that once veined the land have dried up as 60 years of pumping have pulled groundwater levels down by scores and even hundreds of feet. On some farms, big center-pivot irrigators — the spindly rigs that create the emerald circles of cropland familiar to anyone flying over the region — now are watering only a half-circle. On others, they sit idle altogether. Two years of extreme drought, during which farmers relied almost completely on groundwater, have brought the seriousness of the problem home. 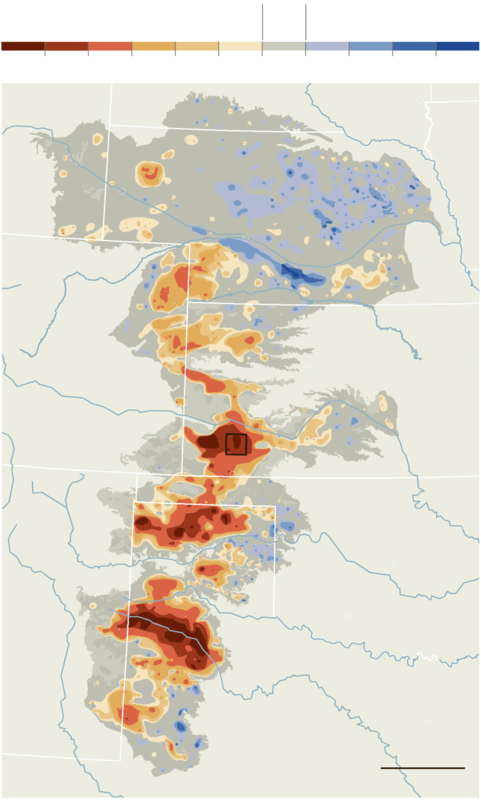 In 2011 and 2012, the Kansas Geological Survey reports, the average water level in the state’s portion of the aquifer dropped 4.25 feet — nearly a third of the total decline since 1996. Kansas agriculture will survive the slow draining of the aquifer — even now, less than a fifth of the state’s farmland is irrigated in any given year — but the economic impact nevertheless will be outsized. In the last federal agriculture census of Kansas, in 2007, an average acre of irrigated land produced nearly twice as many bushels of corn, two-thirds more soybeans and three-fifths more wheat than did dry land. Farmers will take a hit as well. Raising crops without irrigation is far cheaper, but yields are far lower. Drought is a constant threat: the last two dry-land harvests were all but wiped out by poor rains. Some already are. A few miles west of Mr. Yost’s farm, Nathan Kells cut back on irrigation when his wells began faltering in the last decade, and shifted his focus to raising dairy heifers — 9,000 on that farm, and thousands more elsewhere. At about 12 gallons a day for a single cow, Mr. Kells can sustain his herd with less water than it takes to grow a single circle of corn. A version of this article appeared in print on May 20, 2013, on page A1 of the New York edition with the headline: Wells Dry, Fertile Plains Steadily Turn to Dust.